When using Datastream, what do you do if the “Datatypes” button is disabled, or the “No datatype” box is greyed out? There are two common reasons why this happens, with easy but unexpected resolutions. This only applies to Datastream Desktop, (we use version 5.1). 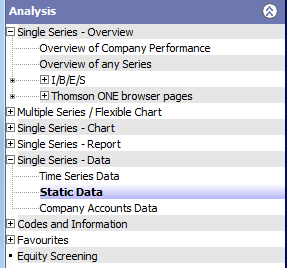 You may have chosen to perform a static request, under the option “Analysis, Single Series – Data, Static Data”. In this case, the datatype is selected under the blue “Settings” button (above the “Run Now!” button). From here, you can select up to nine datatypes using the “Datastream Navigator” button . 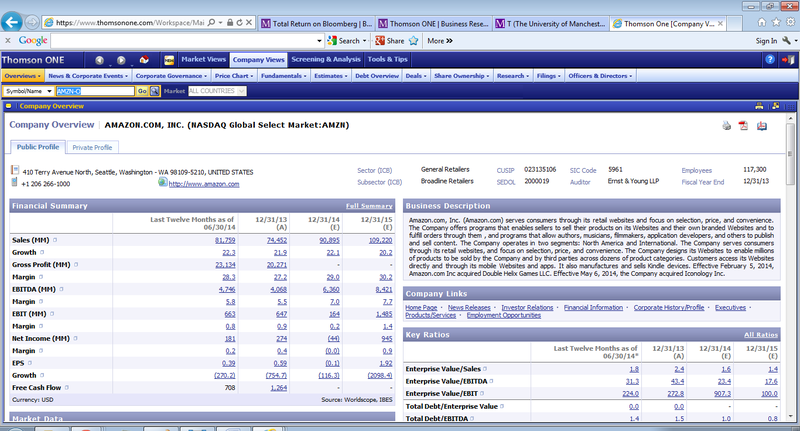 If you have chosen a report, such as “Analysis, Overview of Company Performance”, no datatype selection is available. If you have chosen to perform a time series request, under the option “Analysis, Single Series – Data, Time Series Data”, the “Datatypes” button should be clickable. Next to it is a “No Datatype” tick box which will enable and disable the “Datatypes” button. Occasionally, this tick box gets stuck. You can fix it by doing the following. As you may or may not be aware, Thomson ONE Banker (the service platform for company data) is no longer supported by Thomson Reuters. We have been running Thomson Reuters’ new service platform ThomsonONE.com, in parallel with Thomson ONE Banker, for over a year now. 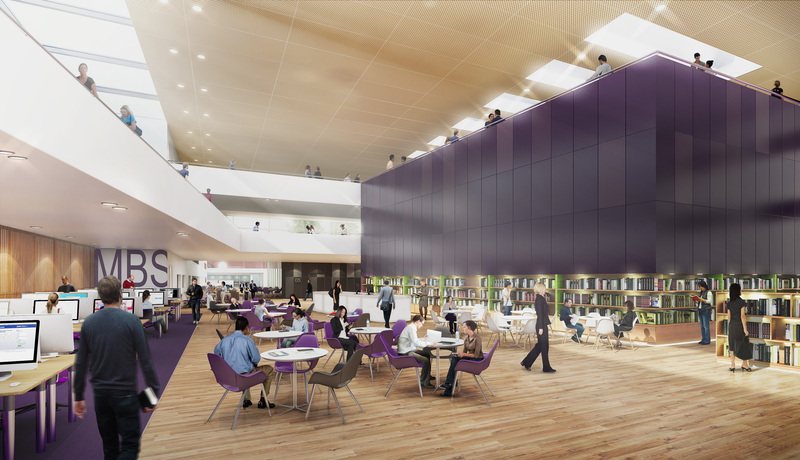 This is a necessary transition arrangement as staff and students require training and adjustment in the new ThomsonONE.com. Recently, we have received feedback from our users that keeping the both Thomson ONE Banker and ThomsonONE.com in the Library’s Database list is rather confusing. We have reviewed Thomson ONE Banker again and have found the platform tired looking and slow performing. With advice from academic staff in Manchester Business School, we have therefore decided to withdraw Thomson ONE Banker from the Library’s Database list from 1 May, 2015. A short hand-out guide is available for those new to ThomsonONE.com. 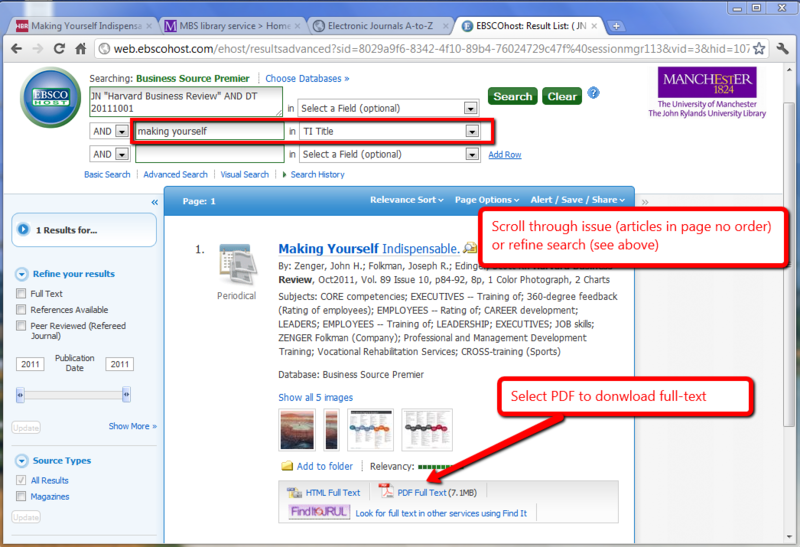 Please visit Getting Started Guides in the Library’s Business and Management Subject Guide pages. Please note, ThomsonONE.com requires Internet Explorer 9. If you are using IE 10 or later, you must use Compatibility View. See our earlier post Thomson ONE.com Browser Compatibility for more details. 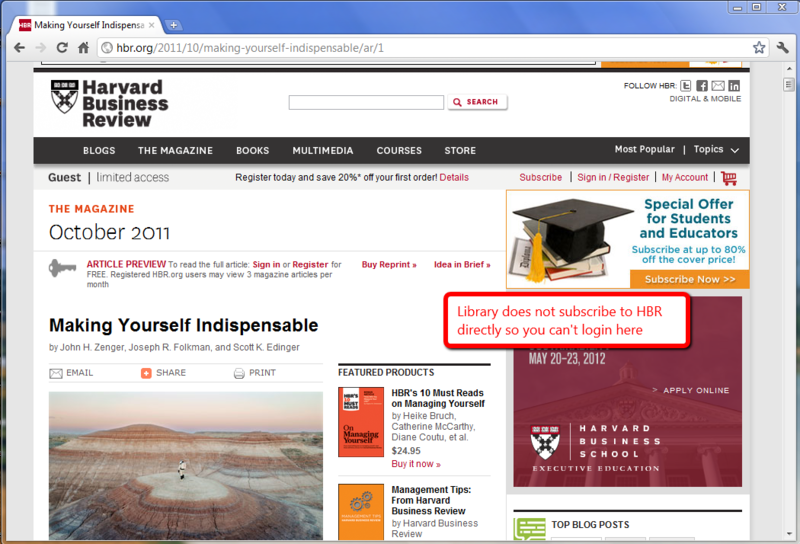 You find an interesting Harvard Business Review (HBR) article on the web and want to read the full-text. You have found your article – keep title, author, year and issue (i.e. the bibliographic details) to hand. 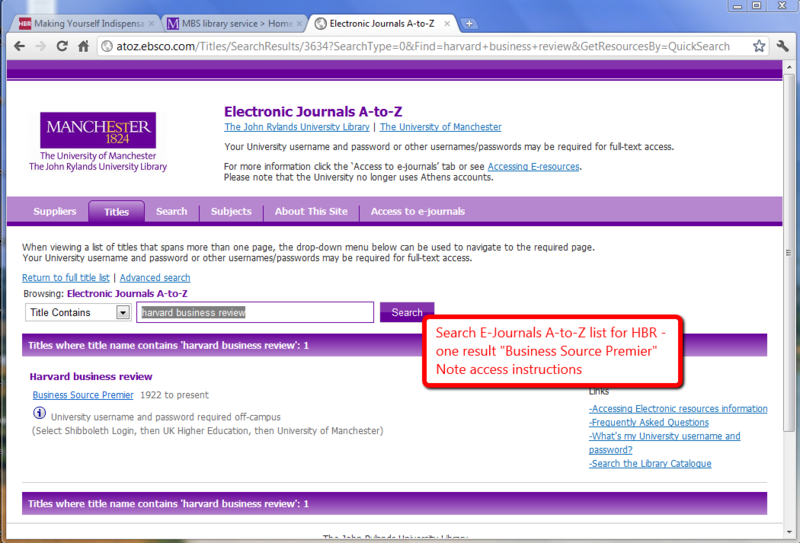 University of Manchester students and staff do not have to pay but you do have to access HBR via a journals database. 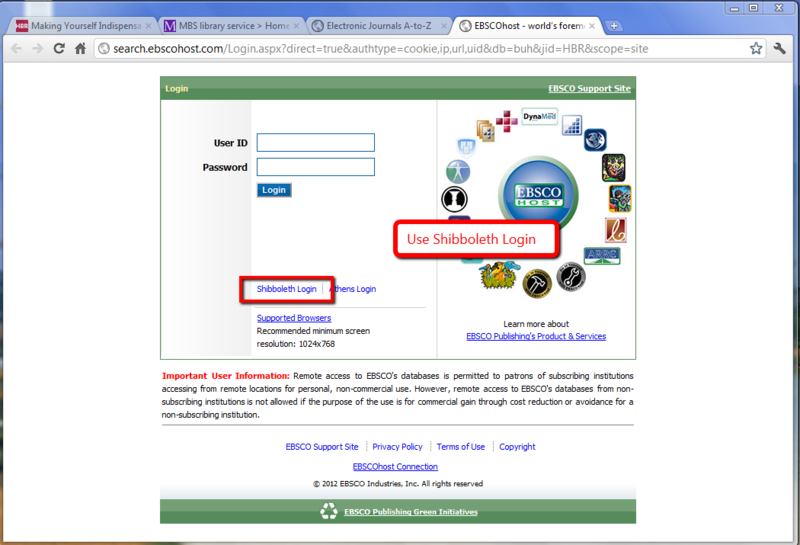 If you are accessing from a mobile device you can use the EBSCOhost app. 1. 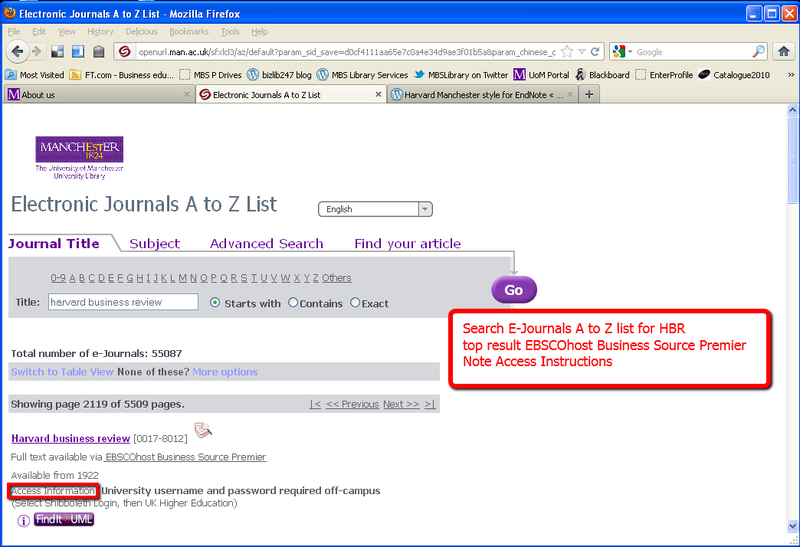 Goto the e-journals A-to-Z list. Search for all journals with the words “harvard business review ” in their title. 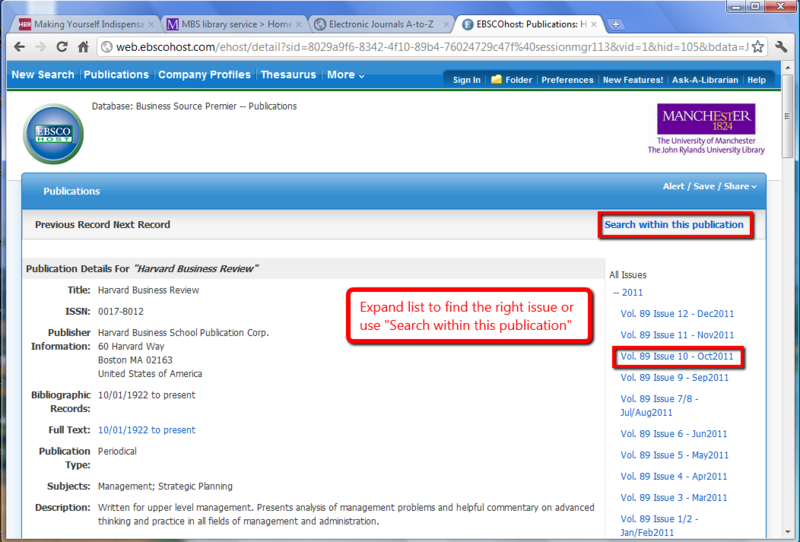 The result indicates that the University subscribes to HBR through the journal database EBSCOhost Business Source Premier. Note the access information, especially if you are off-campus. Click on the link. This takes you to the FindIT@UML for HBR – click GO. This step will vary depending on whether you are on-campus or on-campus. On-campus, your PC is recognised as belonging to the University and no additional authentication is required. [Original now out of date] If you are off-campus you need to select the Shibboleth login link and provide your details (for more detail see previous access Harvard Business Review post). If you are off-campus and using the VPN software then you are “virtually on-campus” – your PC behaves as an on-campus PC. Expand the year (from the article’s bibliographic details) and then select the relevant issue. Use the search within this publication link. You can download the full-text by selecting the PDF full text link. Use the add to folder link and then the folder view and export to add the bibliographic details to your reference management system. For articles from other journals the stages are the same but the details will vary depending on the journal database. For more information look at our research guides or FAQ answers on e-journals. The result indicates that the University subscribes to HBR through the journal database Business Source Premier. If you are off-campus you need to select the Shibboleth login link and provide your details (for more detail see previous access Harvard Business Review post). If you are off-campus and using the VPN software then you are virtually on-campus. For other articles from other journals the stages are the same but the details will vary depending on the journal database. For more information look at our research guides or FAQ answers on e-journals. Business news can be very useful for gaining a detailed international, national and even regional perspective on current and/or historical company/industry events. 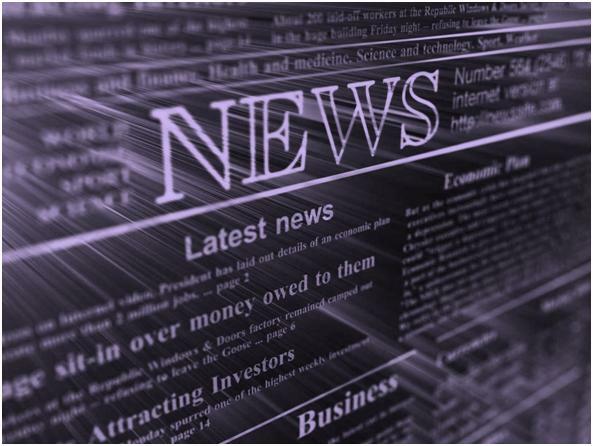 Search across international news sources, eg: newspapers, news feeds, magazines and industry trade publications, to find up-to-date information and to place events and issues in a social or political context. How can Business News Help Me? Use Business News to complement and enhance your company / industry research, many sources may not have the most up to date information for company / industry events. Business news can help you understand what is happening right now and monitor events as they unfold. Our primary source for business news is Factiva, providing international news (in many languages) from global, national and regional sources including newspapers, news websites, newsfeeds, stock exchange feeds, and business/industry specific magazines. Factiva will provide news dating back to the early 1980’s. For further historical research you can also consult our Financial Times and Economist archives which provide a full text archive of every issue of the Financial Times and the Economist from the mid 1800’s including market listings, photos, adverts and indicator tables. These are great resources for understanding the impact of historical events on company/market/economic developments. Where can I get current news about a company? 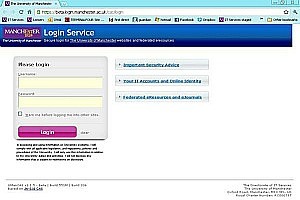 From Monday 20 June, you will see a new screen whenever you are asked to login to a secure University web page via CAS (central authentication system). You will come across this screen when accessing many of the library’s online databases either on or off-campus. The new login screen is designed to be more user friendly and to work better with mobile devices such as smartphones and portal hand held devices. Always check the address of any web page that asks for your University username and password. Never respond to an email that asks for your University username and password.